Take your Star Wars figures outside, like when we were kids. If you are a Star Wars action figure collector, you owe it to yourself to occasionally take your figures off the shelf and relive your childhood by actually playing with them. Oh sure, you can bring a camera along with you to justify your actions to other adults but between us it’s just fun. Try it! It's not always about photographic skills either. It's about having fun with our toys. Nice weather (and no rain) today here in Arkansas, so y’all know what that means?!? Yep some Play Outside pics. I found this mucky stagnant puddle down the back of our property. What better place to hunt down nasty dirty rebels? Had to supplement foliage with some artificial succulents. What’s not to like, Brandon? You’ve done what most kids would have done: seek out some muddy, standing water and add some Star Wars figures to it! The artificial plants give his photos a slightly otherworldly quality too. Great idea! An amazing set of Star Wars figures outside and in action from Josh Deleff. What we really like in many of these photos is that he’s been able to give the illusion of a desert which must be difficult to do considering he’s from Northern Canada. We’re particularly fond of old Ben Kenobi speaking to a couple of Jawas. Be sure to check him out on Instagram where he’s recently posted some really fantastic winter photos. Mark Peirson shares just one photo with us but it’s a doozy and it’s one that any Star Wars fan probably acted out as a child while playing in the snow. Luke Skywalker, hurt and freezing, collapses on the snowy plains of Hoth. He sees….his dead master? What is he telling him? Go where? Dagobah? Mark uses the Black Series Obi-Wan Kenobi Force Spirit figure in the photo and Ben’s cloak and “spirit” paint applications really look great in the snow. Jake Stevens of From 4LOM to Zuckuss returns with another Play Outside entry as he took advantage of an unexpected snowstorm in Washington State to bring us some Sequel and Original Trilogy fun! First up, troopers patrol the snowy plains of Starkiller Base in their First Order Snowspeeder (and looking very much like a Kenner mini-rig). Then, Rogue 4’s Snowspeeder has crash landed in the glacial wastelands of Hoth! We put out the call and you responded with some great photos in the snow! Thanks to Dan, Ryan Holman and Marcus Doidge for your Play Outside Winter Edition photos! PLAY OUTSIDE continues with our first Winter 2019 entry from our good friend, Erin Gaudette (aka Erin From Work)! From the barren ice fields of Hoth to the headquarters of the First Order, Starkiller Base, Erin shows us that even the cuteness that is the Funko POP! can become an action figure under the right conditions. We present a mix of photos sent to us from various listeners. 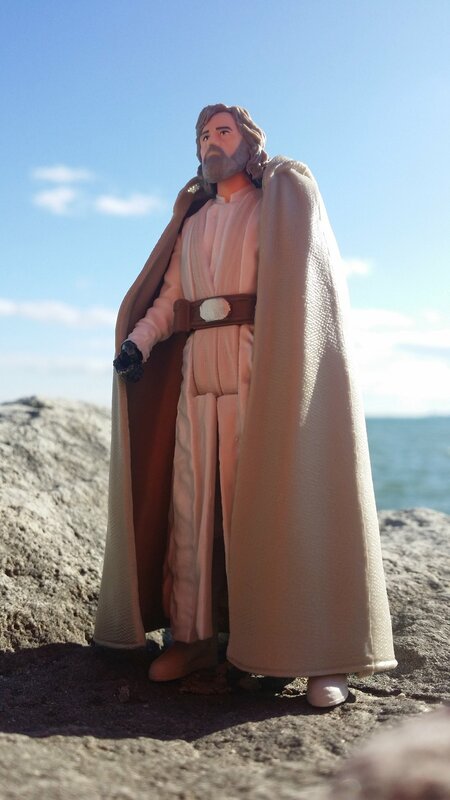 We are really overwhelmed by the response we got for our request for photos of your Star Wars action figures in the outdoors! It’s great to see that for alot of people we’re never too old to take our toys outside and play with them. Thank you to everyone that sent us photos or tagged us on social media. Whether it’s summer or winter, anytime is a good time to PLAY OUTSIDE! Artoo and Threepio watch one of the last sunsets of the summer go down over Lake Huron. Taken at Pinery Provincial Park. I was experimenting the other day with some of my Endor Strike Team figures here in my backyard in Brisbane, Australia. Here I like to think they're traversing a broad Endorian meadow, watching their flanks because there's little or no cover. C’mon, admit it. It’s impossible to criticize Star Wars’ best peg warmer when he’s being all patriotic! Christopher Leddy, @vintageviewport has a particular collecting focus. He collects the Kenner Rebel Commando. He started posting these photos on his Instagram and we had to ask for a few as we wrap up our PLAY OUTSIDE feature. Head to Chris’ Instagram for more fun Rebel Commando photos! Mark has Dengar standing guard outside of the Sandcrawler as it stops in the woods and Mark tells us that we should just pretend that Tarkin is in the cockpit and that’s why he’s not in the photo. Brandon Taylor’s final PLAY OUTSIDE photo has a member of the Empire’s Inferno Squad on the hunt with his astromech, deep in the woods searching for Rebel activity. Luke Skywalker has made a new home for himself on a remote planet. Off in the distance he sees his old mentors. Or maybe it’s the local fauna? The dunes of Pinery Provincial Park have replaced the desert sands of Tatooine as Mac recreates one of his favourite comic book covers from the vintage Marver Star Wars series using Kenner action figures. Brandon Taylor returns with another awesome set of Star Wars figures in action! In the swamps of the Outer Rim planet of D’Qar a platoon of First Order Troopers search out the remaining Resistance Fighters that weren’t flushed out by the initial assault. When we were kids, we would play with our Star Wars figures and maybe wish we were were one of the characters, living out some high adventure in a galaxy far, far away. As adults we continue to collect Star Wars toys and if we haven’t become too jaded with the realities of real life we might still have that wish. Marcus Doidge has taken that idea and ran with it. He has created custom action figures of himself and his wife and took them on vacation where the figures are basically doing the tourist thing themselves! It’s a great twist on our Play Outside feature and makes us wonder, is there Star Wars figures that look like us and if so should it look like it's having more fun than us? As is typical with alot of Star Wars movies, we often get action figures for characters that were barely, if at all in the actual film. Case in point, the Mimban Stormtrooper from Solo: A Star Wars Story. With his cape and mud-splattered armour, the Mimban Stormtrooper is a pretty cool variant of your usual TK. The Force-Link version of the character is a very cool toy, even if the figure’s articulation is limited. The super long rifle, slung over one shoulder just adds to the cool factor. I took these photos at Killbear Provincial Park this past summer, and realized after sifting through them that I had sort of made a loner of the trooper. But I think it suits him in a Boba Fett sort of way. He’s even too cool to advance up the hill with the rest of his squad! UP FROM THE DEPTHS!!!! IT CAME FROM ANOTHER PLANET!!!! LYING DORMANT FOR CENTURIES IT HAS AWOKEN FROM IT'S WATERY SLUMBER!!! AND IT IS HUNGRY FOR BLOOD!!!!! If anyone could get in contact with Tom Kane, we could have him do a great voice over for this! Sandcrawler co-host, Mac visited his favourite place on earth, Killbear Provincial Park and brought along the awesome Acklay from Attack of the Clones. But instead of keeping the toothy dude in the prequel era, Mac chose to have him attack a squad of Shoretroopers along an isolated shore of Scarif. Our second set of photos from Brandon Taylor are full of colour and action and shore troopers from Rogue One! Brandon tells us, "What do you do when you take a family vacation to the beach??? Well bring the shoretroopers along for the fun. Had to share my last pictures. Have some more from these shoots if y’all would like to see them." -we sure would like to see them, Brandon! David Fronsee and his family took a trip across the country and he brought some Star Wars figures along! The family's ultimate destination was Seattle and also Everett, WA the headquarters of FUNKO! Along the way they stopped at a bunch of cool American landmarks, with their Star Wars Funko Mystery Minis in frame! David chronicled the whole trip on his Twitter account and sent us the highlights! Chris Leddy (@VintageViewport) shares some fun he had with his daughter and his Star Wars figures: "Hey guys, set up a little diorama today with my daughter, Cecilia. We’re calling it a “Corellian Imperial Outpost.” Made sure to include Dengar and Tarkin for you two. I know it’s amateur, but hoping to eventually do some higher quality set ups some day. Enjoy! Chris, it ain't about quality, it's about heart and your photos have a ton of it! Let's start with the first image which looks like it was taken from a Sear's Christmas catalogue from the early 1980's! The real world or "found" items that he used such as the flipped over metal basket, now a prisoner hold. Random metal boxes make up the "buildings" in this scene which reminds us of being kids, using what we could find or scavenge from the kitchen or garage. There are so many bad dudes in this scene that maybe it should be named the "Most Wretched Hive." But there IS Ahsoka Tano lurking in the bushes so maybe it's the bounty hunters and imperials that should be careful. Extra bonus points for the small fire pit out front and double-points for the use of both Dengar and Tarkin! In the Sand With Star Wars Command! Paul VanDyk brings us a great set of photos of playing outside on the beach at Rondeau Provincial Park. Instead of the usual 3.75 or 6-inch action figures, Paul and his son brought along some "Star Wars Command" figures, based on that old standby-little green army men! Paul says it was a blast playing with his son but, alas, the Rebels lost. A quick head swap and a squad of Death Troopers become Punisher Squad! Brandon adds an extra layer of storytelling to the troopers we first met in Rogue One by giving the squad leader a Frank Castle (AKA The Punisher) head. With his military haircut and serious expression he makes an excellent squad leader. See more of Brandon's awesome toy photography on his Twitter account. Canadians love telling people when someone famous is Canadian. If you've listened to the show you'll already know of Mac's love of rebel pilot, Dutch Vander, played by Canadian actor, Angus MacInnes. Another Canadian that flew in the Battle of Yavin is Luke's best buddy, Biggs Darklighter, played by Garrick Hagon. That's pretty much the premise for the following series of photos as Dutch and Biggs scout out locations in the Yavin system. Friend of the show, Jake Stevens was kind enough to host this fun photo story on his site last year. We thought it would be fun to revisit it again. Happy Canada Day, eh! Chris Pratt's scene of taming raptors in Jurassic World became quite the meme a few years ago as people recreated the scenes with zoo animals, children and chickens. Rex On Leave was right there in the thick of #JurassicZooKeeper. But in keeping with our Star Wars theme, Rex chose to fight lizard with lizard by replacing Chris Pratt with the bounty hunter Bossk! CLICK THE IMAGE FOR MORE OF REX'S PHOTOS. At first glance, this photo looks like a still from A New Hope as Ben Kenobi and Luke Skywalker help See-Threepio to his feet after the Tusken Raider attack. In fact you are looking at action figures. We are thrilled to feature Matthew's Instagram feed on our site as he has taken some stunning photos of Star Wars (and other) toys in the wild. Click the photo below to see Matthew's Instagram account. Our good friend (and the voice you hear at the beginning of each episode) Chris Hamilton, took these adorable pics of his equally adorable daughter, "T" who is 6 years old. We aren't entirely sure which part of canon her action figure choices are from but hey, it's Star Wars! Bonus points for the turret behind the AT-AT. Maybe the gang in the walker went for a stroll to Vader's castle? Our good buddy, Jake Stevens sends us a few quick photos he took during a bbq. It's that simple! Heading outside? Grab a Star Wars figure or two. Jake has chosen two creepy and bug-like characters, Moloch from Solo: A Star Wars Story and the bounty hunter, 4-LOM. These two might carry blasters but at least they won't sting or bite you! Check out the eerie green glow that's just peeking through 4-LOM's eyes. A really fun feature in the Black Series version. Jake's dog seems to have taken an interest in the bounty hunter too. With all the brown grass surrounding Moloch, he looks even more like a locust or grasshopper. Big thanks to Gretchen Winkler for being our first guest post to Play Outside! Gretchen shows us what life as a bounty hunter on vacation must be like. From IG-88's beach blanket to a clone trooper kickin' back and catchin' some rays, Gretchen's photos are a real Beach Blanket Bounty! Han Solo and Chewbacca receive a very special cargo from another smuggler only to find out that it's a shipment intended for Jabba the Hut (spelling and figure used are intentional). Having messed up one too many deals for the crime lord, Solo is confronted by Jabba and his goons to informs Solo just what's at stake.